Sheraton Vancouver Airport Hotel is a 3-star hotel near the Vancouver Airport, with complimentary airport shuttle service. During my stay there, it also seemed to be used by airline crew, and tour groups quite extensive. A category 2 SPG hotel, it is decent redemption value in a good location. Consisting of three wings, this large hotel is actually a pretty decent airport hotel. Quick. But this really depends on your luck. If you get stuck behind a crew, or a large tour group, you might be out of luck. 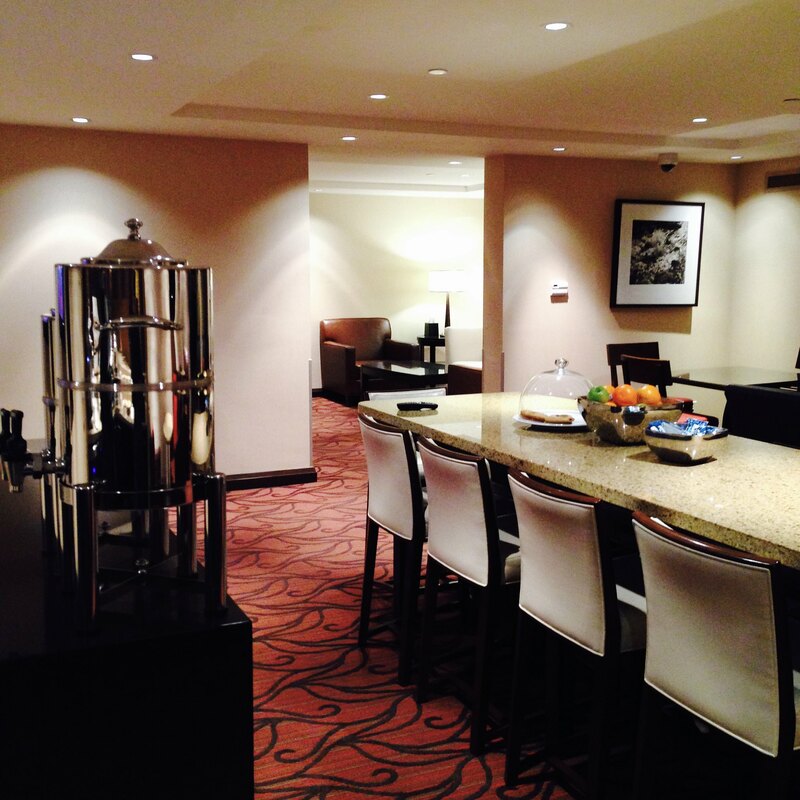 I recently got an Amex SPG Business card, which gives me complimentary lounge access. I mentioned it to the front desk, and was giving lounge access without confusion, so that’s good. Richmond. The area around it has a lot of shopping and there are many excellent restaurants. If you are trying to get to Vancouver without driving, it is within walking distance of the metro system. If you don’t want to drive into Vancouver, it’s not a bad idea at all. We booked a two queen room. We were given a room (480) in the South Wing, which faces the parking lot, and is far away from the elevator. Getting a room somewhere in the middle might be better. While 480 one of the furthest away from the elevator, it is pretty close to the main street (Westminster Highway), which has some traffic noise. The elevator is rather loud, so you don’t want a room near there as well. The room is really large, with two queen beds, and a lounge chair by the far end of the room. There is also a nice-sized balcony, but as it faces the parking lot, and didn’t have patio furniture, I had no incentive to hang out there. The bathroom is on the average side of things. A small complimentary bottle of water is provided. It is placed beside a larger bottle of water, which is not free (4.50 CAD), so before you grab both, thinking they are free, think again. 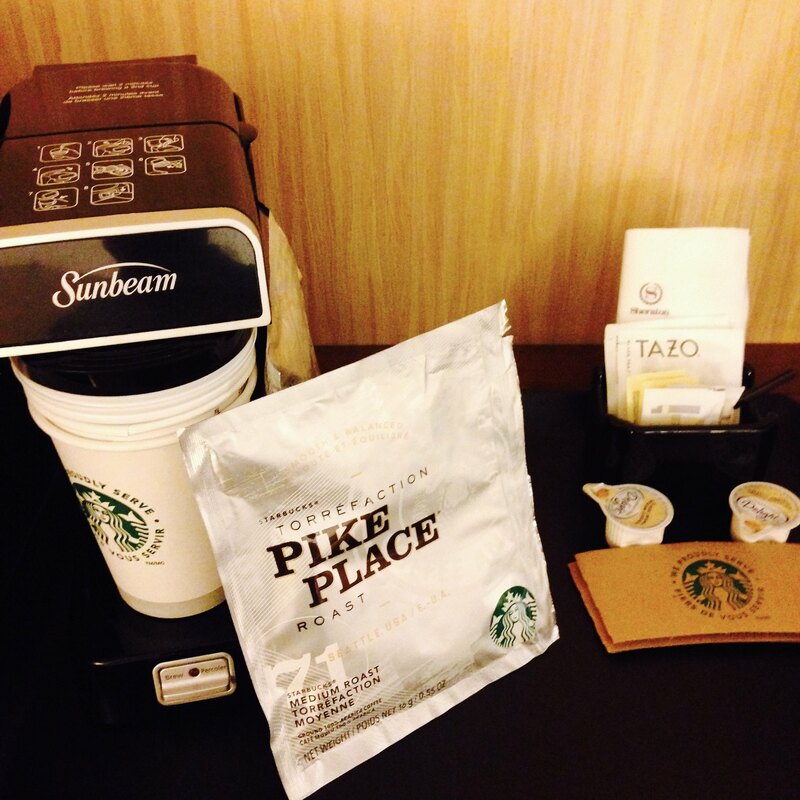 I did not try out the coffee machine, but I do like that they stock Starbucks coffee. While I’m not a huge fan of Starbucks, that’s still better than mystery coffee sometimes. 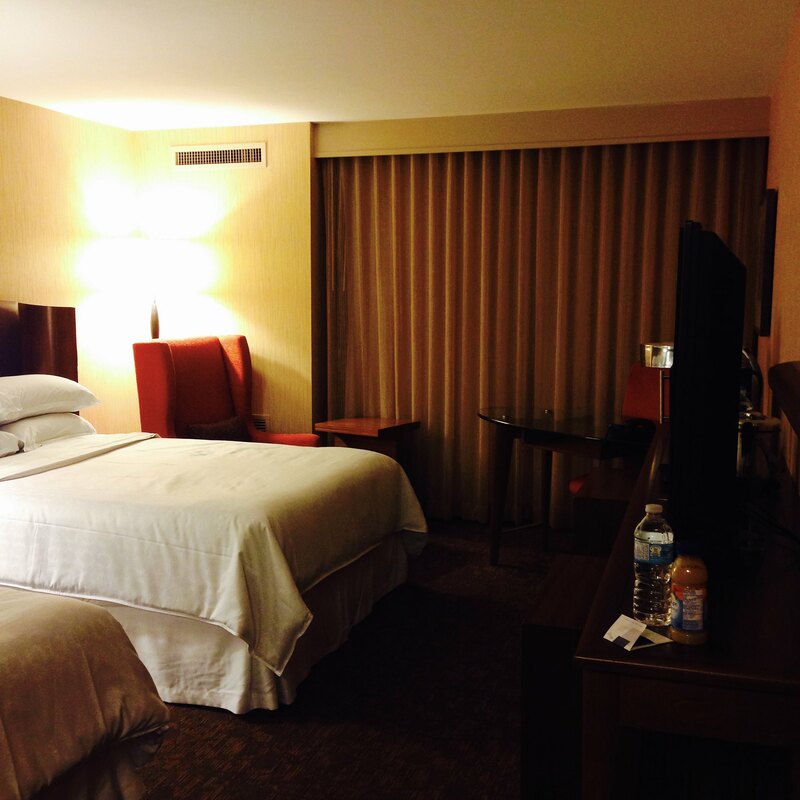 The bed was very comfortable, and there are a lot of power outlets, both by the bedside, and also on the desk. If I have a complaint, it would be the rather oversized lamp on the bedside table, which left little room for much else. It was complimentary for me, and includes up to five devices for each room. It was decently fast, and worked well throughout the property. The gym is 24 hrs, and pretty large, with a decent offering of machines. They have three different rooms, one for cardio, one for weights, and one for more stretchy/yoga type exercises. It is pretty small in size, with a rather limited offering, but to be fair, it never got crowded. 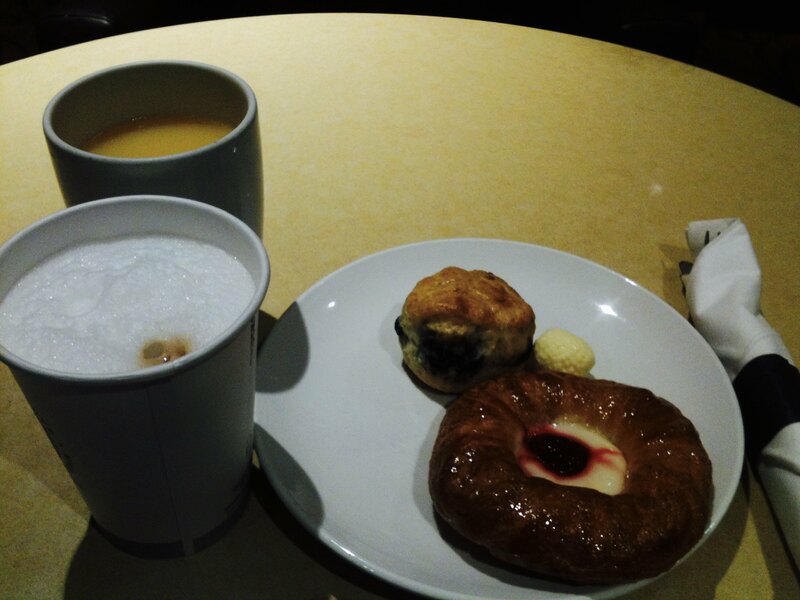 The most number of people I saw was at breakfast, and including myself, was a grand total of six people. 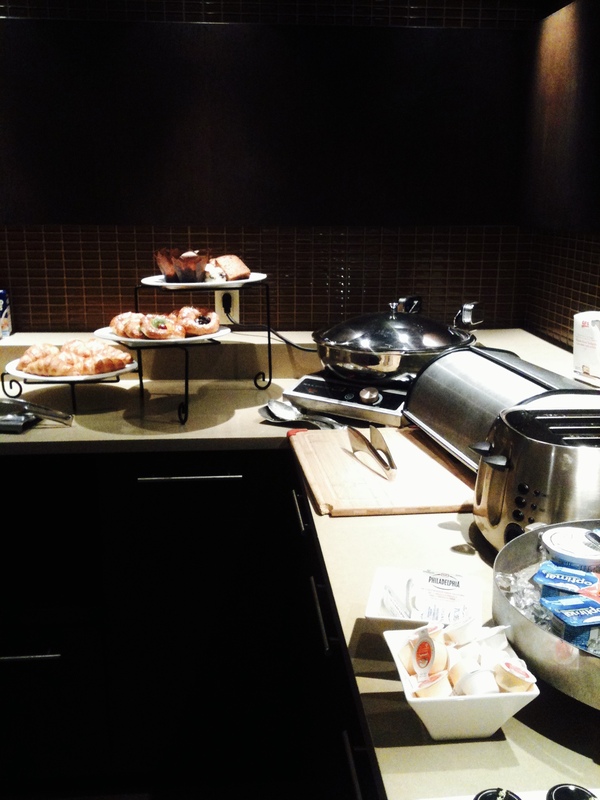 Breakfast is from 6 – 9 am, and hors d’oeuvres is served from 5 – 9 pm. Non-alcoholic beverages are complimentary from the fridge, but alcoholic beverages incur a charge. Breakfast is continental, with a dish of eggs, while they had egg rolls, dumplings and popcorn chicken for evening hors d’oeuvres the evening we were there. I did like that they put out fresh juice for breakfast, and they have a good espresso machine. For an airport hotel, it is actually pretty nice. They have a heated outdoor pool and jacuzzi. In the morning, I actually saw people using it, so I’m assuming that means it’s extremely usable even in winter. They charge for overnight parking, and it’s ~18 CAD. We were too lazy to drive around looking for street parking, so we just sucked it up. I think it’s a pretty nice airport hotel, but your experience can vary greatly, depending on the room you get, and if you arrive/depart at a busy time. We had a great stay, so no complaints!